Silver Stamped Navajo Pearl Necklace handmade by Marie Yazzie. Silver Stamped Navajo Pearl Necklace handmade by Marie Yazzie. 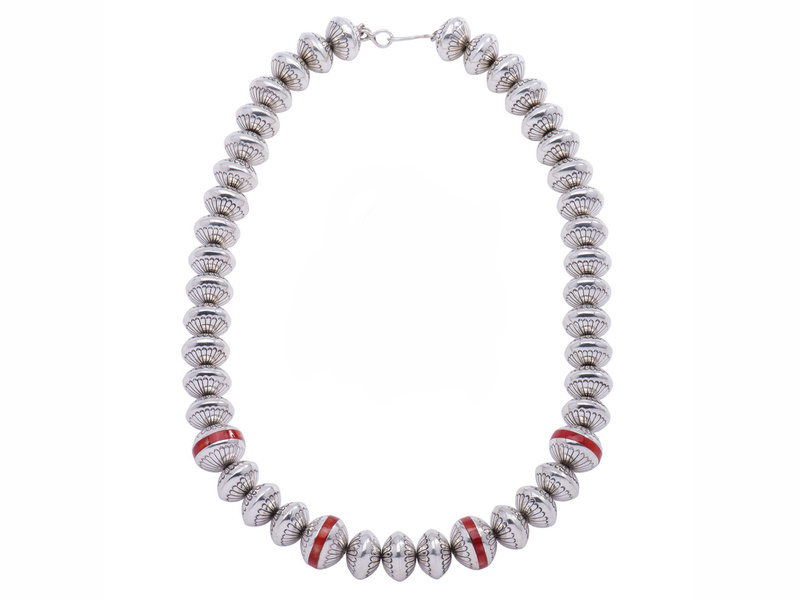 This elegant necklace features hand stamped sterling silver beads. 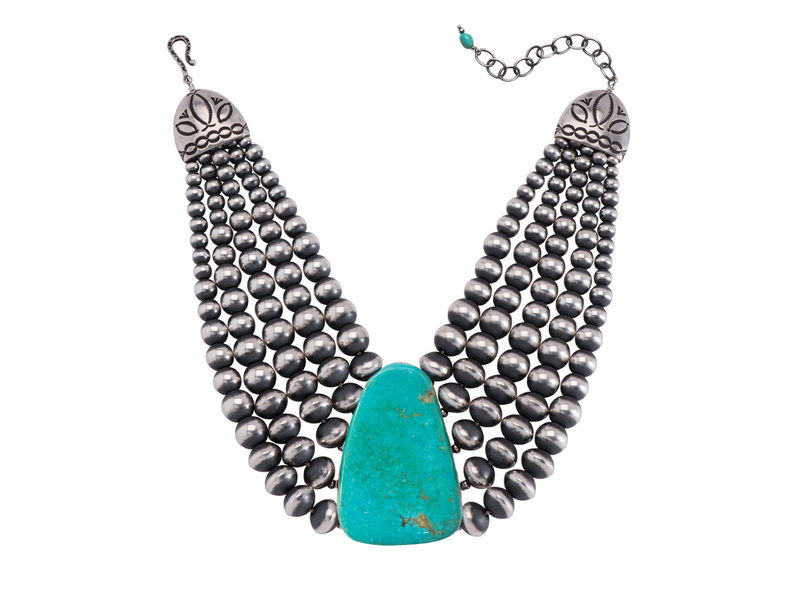 The necklace measures 25″ inches long. Marie makes stamped and unstamped silver necklaces of varying length. Her beads are created by hand through a time-consuming, exacting process. To begin, she stamps designs on blank silver disks by hammering metal punches (or dies) onto the surfaces. Most designs require a number of different small, detailed stamps to create the overall image. The stamped disks are then domed by punching them with a cone punch into a concave wooden block. Marie’s process is quite different from the embossing technique, where an entire pre-formed design is stamped with one punch at the same time the disk is domed. Each bead is hand filed after doming, to smooth edges and fit evenly with the other beads. If the necklace is to have beads of graduated size, the beads are domed in a set of graduated concave forms or in a dapping block, a multiple cavity steel block. Using hand tools, a hole is punched in the center of each bead. 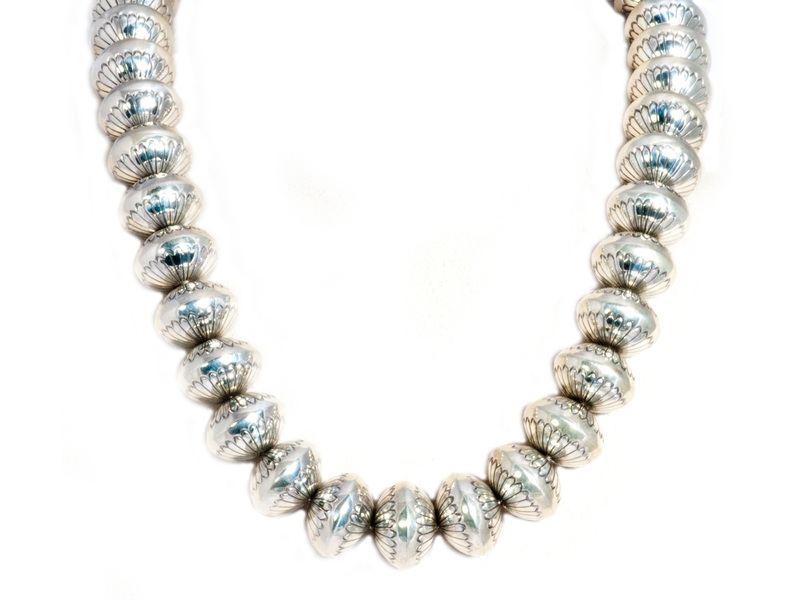 To create the bead, two halves are soldered together using narrow strips of silver solder and flux. Soldered edges are then filed smooth and the beads are polished.